Shares of SanDisk Corporation (SNDK) are popping to new session highs on increasing volume as more than 6.6 million shares have changed hands vs a 3-month average volume of 11.7 million. SNDK advanced 1.2 percent to $39.24 after rising 1.72 percent earlier. The ticker’s strength is attributed to a Globes Online story, suggesting that behind the resignation of SanDisk founder and CEO Dr. Eli Harari lies an orderly plan to delist the company during the next year. Pouring more cold water on the company’s situation, and also reinforcing the notion of a mediocre performance from the chip maker’s stock over the coming months is Wall Street’s most powerful firm Goldman Sachs (GS). The investment bank lowered its recommended price on the SNDK shares to $36 from $40, just two days ahead of the co.’s earnings report. 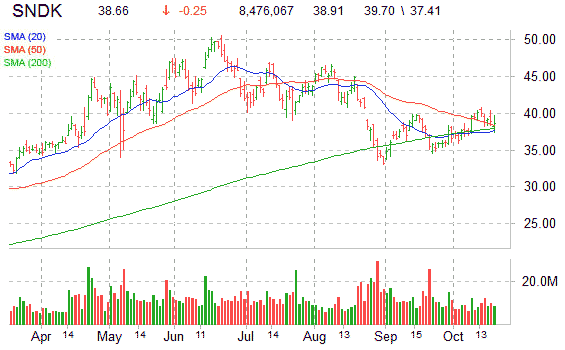 Technically speaking, the shares of SanDisk are currently trading 2.05% above its 50-day moving average of $38.39 and 3.2% above its 200-day moving average of $37.94. The equity has been creating a series of lower lows, after it peaked at $52.50 (throughout this time, SNDK has relied on good support from its 20-SMA trendline located at $37.67 area) since July of this year. Meanwhile, the short seller are adding to their bearish bets. Short interest at SanDisk currently stands at 18.4 million shares, the highest in the past year. This accumulation of bearish bets accounts for nearly 9.60% of the company’s total float of 229 million. At last check, SanDisk shares were up $19 cents to $39.10, a gain of 0.49%.